Growing up, for me and my sister, one of our favorite evening brunches was - to devour on munchies usually made up of 'puff pastry'. Back then, making all these goodies at home was a distant dream and were something we could get only in a bakery shop. Each puff (veggie or egg) used to cost Rs 2 each and I used to save up all my pocket money to splurge on these yummy, buttery goodies, every now and then. ...it is cold, rainy and depressing here on west coast ( thanks to the untimely storm). So, I thought this is best time to warm up the house with some puff pastry goodies. these are some of them and there are more coming as I have one more pastry sheet, still in my freezer. Enjoy! 1. Thaw one frozen store-bought puff pastry for atleast 15 minutes. 2. Stir in 1/4 cup parmesan cheese, chopped cilantro (or parsley works too) and garlic powder in a bowl. 3. Preheat oven for 400 F.
4. Beat one egg and 1 tablespoon of water in a small bowl with a fork or whisk. (optional - I didn't have any egg on hand, so skipped this step). 5. On a floured surface, unfold the thawed puff pastry sheet. Roll out into a rectangle and cut into 2 halves, lengthwise. Brush the halves with the egg mixture. Top one half with the cheese mixture. Place the remaining half over the filling, egg-side down. Roll gently with a rolling pin to seal. 6. Cut the pastry crosswise into thin strips. Twist the strips and place on a baking sheet, pressing down the ends. Brush the pastries with the egg mixture. 7. Bake for 10-15 minutes or until the pastries are golden brown. 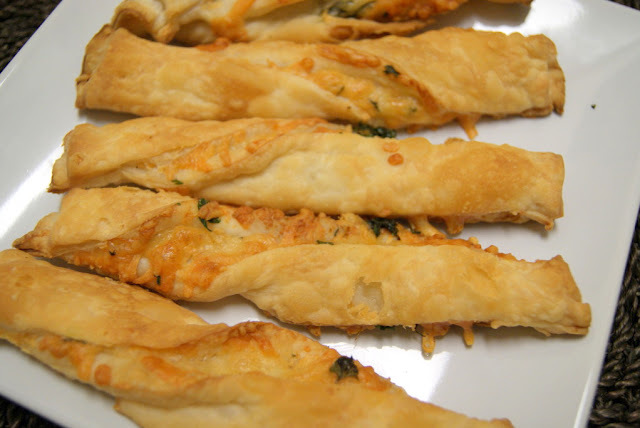 Remove the pastries from the baking sheets and Serve warm as-is or as a side dip for a hot soup on a cold, rainy day!. 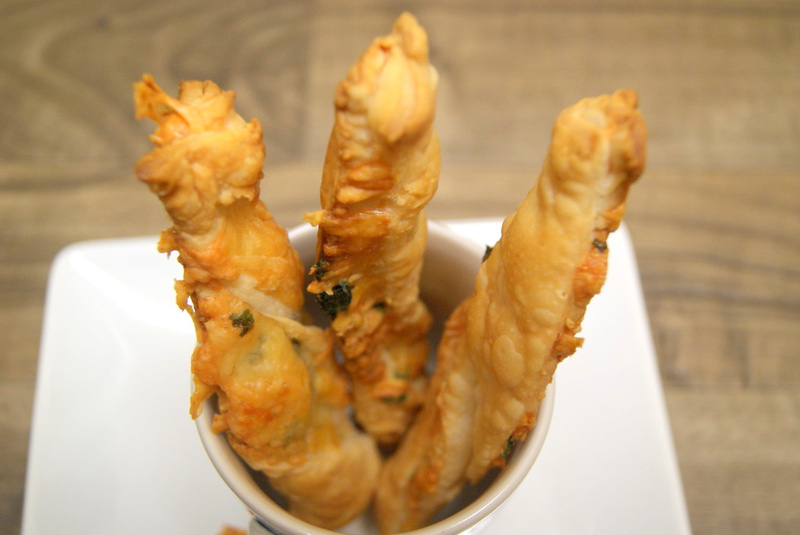 I had about 1/4 strip left-over so, tried my hand on these absolutely delicious "Jalapeno Poppers". They are real simple to make. Thaw the pastry sheet, Roll it out and cut into squares. Cut the jalapenos, lengthwise, remove the seeds. A variety of fillings can be used here - from cream cheese to goat cheese paired with seasoning such as cumin powder, italian seasonings etc. - the possibilities are just endless. I used a combination of shredded Monterey Jack Cheese with Cheddar and Asiago cheeses. 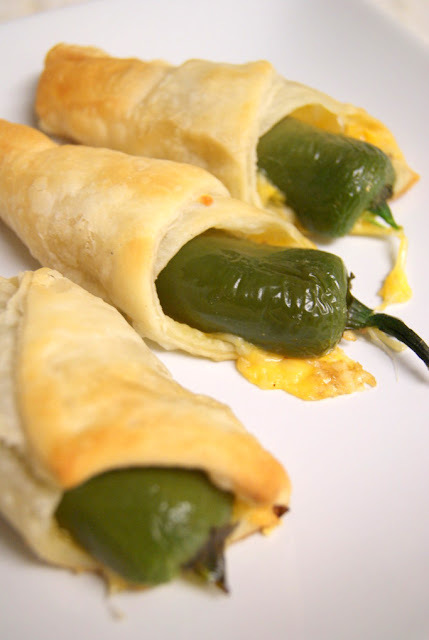 Fill these into the jalapeno halves, keep the cheese side-down on each puff pastry square. Fold each corners in and seal with little water. Brush with egg + water mixture. Bake at 400 F for 10-15 mins or until golden brown. P.S - I was in a real hurry so didn't wait until the poppers were golden brown. Nevertheless, these were a big hit and tasted delicious. If you think these taste too spicy (becoz of the jalapenos) then that is not the case at all. The spice level was very moderate and within 10 mins of baking, they were subtly caramelized with a nice crunch to it. :-). For me, it reminded me of a Chile Releno. Yum! Hope you all had a lovely Thanksgiving with your friends & family. Woww tempting cheese sticks, looks fabulous..
Those look to delicious Siri and you've got the color so perfect. Wow, they look so delicious and tempting.